The System - General Settings page of the Preferences dialog. The System – General Settings page of the Preferences dialog provides controls relating to the general behavior and configuration of the workspace. 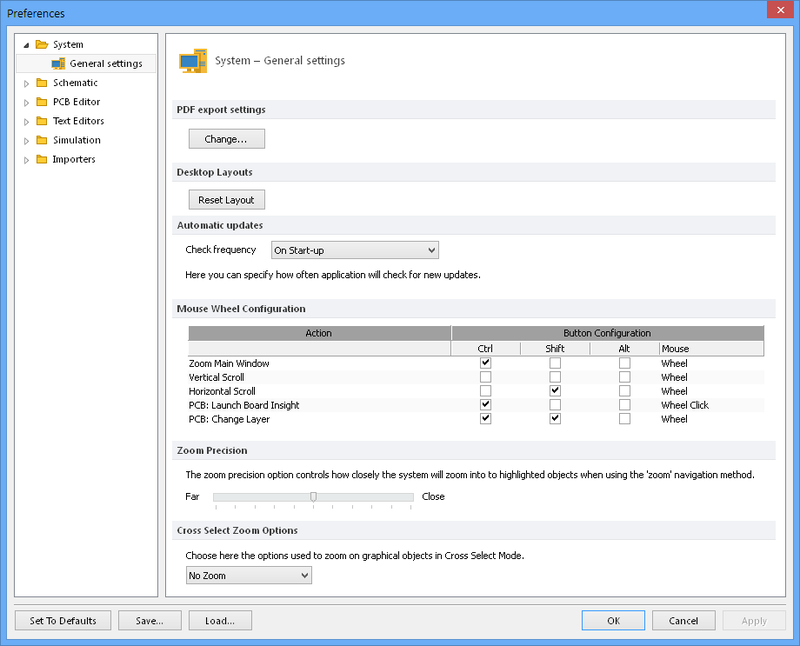 The System – General Settings page is part of the main Preferences dialog (File | ) and is accessed by clicking the General Settings entry under the System folder, in the left hand pane of the dialog. Define PDF generator page configurations in the Custom page sizes for exporting to PDF dialog, opened by the button. Use the button to return the desktop layout to its default configuration for the position/visibility of panel and toolbars, the size of document windows, and so on. Select how often the system will check for software updates from Altium's cloud-based repository. Choose from a range of preset update periods, including 'On Start-up', in the Check frequency drop down menu. Configuration settings for a mouse that has a scroll wheel between the two mouse buttons. Action - The list of mouse wheel configurations for various actions on a document, such as Ctrl + mouse wheel scroll to zoom in or out in the PCB/Schematic workspace – the default configuration for the Zoom Main Window setting. Button Configuration - The list of mouse wheel configurations for each action on a PCB/Schematic document. For example, the default PCB: Change Layer configuration is set for Ctrl +Shift + mouse wheel scroll to move through the available PCB Layers in the PCB editor workspace. The zoom precision option controls the degree of zoom applied when objects are highlighted during a zoom navigation action (such as in Cross Select Mode). As the slider is moved towards Close, the magnification increases. No Zoom - The corresponding PCB/schematic document will select the object without zooming into it. Zoom to Last Selected - The corresponding PCB/schematic will zoom into the most recently selected object, when multiple objects have been selected or (obviously) when a single object has been selected. Zoom to All Selected - When multiple objects have been selected, the respective PCB/schematic will zoom to show all selected objects. See Cross-Probe & Cross-Select Tools for more information. – Reset CircuitMaker's Preference settings to their default configuration. – Save the current Preferences settings the local drive as a *.DXPPrf file. – Load a previously saved DXPPrf file to configure CircuitMaker's preferences to those settings.